If you've got kids you've most likely got bath toys, and way more than you wish you had. We actually have a rule in our house now that if we get new toys to play with in the tub, some of the older (and yuckier) ones have to be thrown out or donated to others. It keeps the pile from getting too big. However, you still have to figure out what to do with the ones you've gotten. 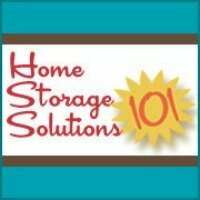 This product provides a good solution. Basically, there are two ways to organize bath toys, with a bag of some sort that suction cups to the wall (like what is shown), or a plastic organizer that you lay over your bathtub. It is really your preference which one you choose, since both have their advantages and disadvantages, which is why I've featured both products on the site, so you can choose which one is best for you. The disadvantage with all the ones which stick on the wall (including this one) is making sure they stay there. After all, it is just up there with suction cups, and an excited child can easily pull it down trying to get their toys. I've chosen to feature this one, because it has the most positive reviews in this regard. In addition, this bag is not just flimsy net like some bath toy organizers, which can start to mildew with time, as they stay wet. Instead, it is made with neoprene, which dries quickly. Plus, if it does start to get a bit gross you can actually throw it in the washing machine to get it clean again. I would caution, however, that you need to carefully squeeze out all the bath toys before placing them in the basket, so they can actually get dry, or with time all your toys will get pretty gross with mold and mildew. 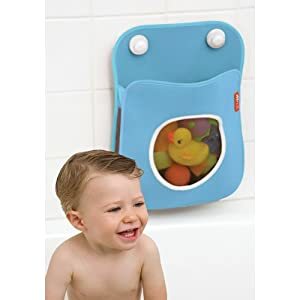 The major advantage of bath toy storage bags, like this one, which stick on the wall is that they don't get in the way when trying to bathe your child like is possible with the ones that fit over the top of the bathtub.